Nixon Motor Sports: "Coneavore" Now For Sale! 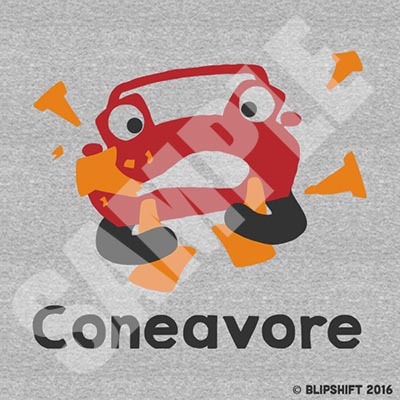 As of TODAY, for two days only, you can buy Brian's "Coneavore" design as a t-shirt (or in other cool formats) from our friends at Blipshift! Go! Now! Check it out! JUST an awesome t-shirt not enough? Blipshift will throw in 50% off Grassroots Motorsports magazine with every Coneavore shirt ordered! Blipshift is a company that makes all kinds of cool gear-head t-shirts and publishes cool designs by artists from all over the world. Grassroots Motorsports is a top choice with Nixon Motor Sports. They cover all kinds of low-buck and amateur motorsports and provide great how-to articles and information to help give all of us lots of bad ideas about how to spend small amounts of money on big amounts of car fun. We found out that Blipshift sold about 300 of Brian's CONEAVORE design t-shirts, thanks!